Between the world of today with an economy relying on fossil fuels and the world of tomorrow relying only on clean and low carbon energy sources, massive investments in energy efficiency are required. These investments will be able to bridge the gap, the chasm, between these two worlds. This book brings many more ideas and figures. Utilizing combined heat and power (CHP) : Current electric plants have an efficiency of around 33 percent. By capturing and using that heat for houses and buildings nearby, we could reach an efficiency of 50 tio 80 percent. The potential for the United States alone is of 135 GW. Increasing energy efficiency in industrial processes and buildings. As we have seen in countless occasions in this blog, energy efficiency – or negawatts – have a huge potential. For buildings, you may read extracts of my own Master’s thesis on the residential sector in France. Increasing energy efficiency in consumer end uses. A future example of this would be the energy efficient air conditioning system I blogged about this summer. There again, the potential is huge. Kick-starting the micropower revolution, or “rooftop” revolution. Producing your own electricity is possible with the rise of solar photovoltaïc, which provides several advantages over centralized solutions like burning fossil fuels. Substituting energy services for products. People do not need gasoline, they need mobility ; similarly they do not need fuel, they need heat for their houses. Redesigning buildings and cities for climate change. Cities in coastal areas – accounting for a large share of the global population – will be under serious threat as seal level rises because of climate change. This is why rebuilding them is important. See these articles for more on rising sea levels. Conclusion : I consider Crossing the Energy Divide as a real must read and an eye opener as it brings many details on lesser talked about solutions and their huge potential. 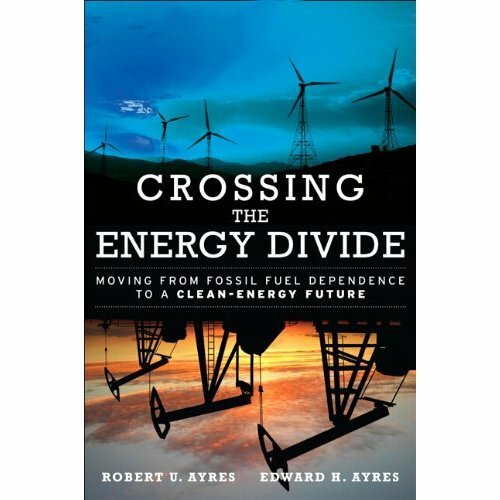 I knew that solving what I call the climate energy equation was not a problem of technology but of political willingness to apply them and Robert and Edward Ayres convinced me even more.